Due to the unhealthy lifestyle and imbalanced diet that includes fast foods and sugary drinks, people nowadays are prone to obesity and overweight. Obesity and overweight can lead to many health issues such as heart disease, diabetes, and certain cancers. If pregnant women have excess weight, that can affect them and their child. People who want to lose weight often try many ways including exercise, calorie reduction, healthy diet, and supplement taking. Some people try to lose weight by excluding fruit juice and other drinks from their diet. It is a common misunderstanding that many people have made. You can lose weight in a week with water and drinks. In this article in AllRemedies.com, we would like to introduce to you amazing and delicious beverages that help you to lose weight and prevent overweight. Water plays an important role in our life. It keeps your body hydrated, boosts the function of the body’s organs and tissues, prevents health problems, and makes you beautiful. Water has a lot of amazing health benefits. One of them is to help you lose weight. Therefore, water is the best choice if you want to know how to lose weight in a week. It is recommended drinking enough 8 glasses of water daily. If you do not like drinking water or feel that drinking water is boring, you can try to add lime, cucumber juice, or a slice of tomato into your glass of water and drink it daily. It becomes delicious, and it works effectively. 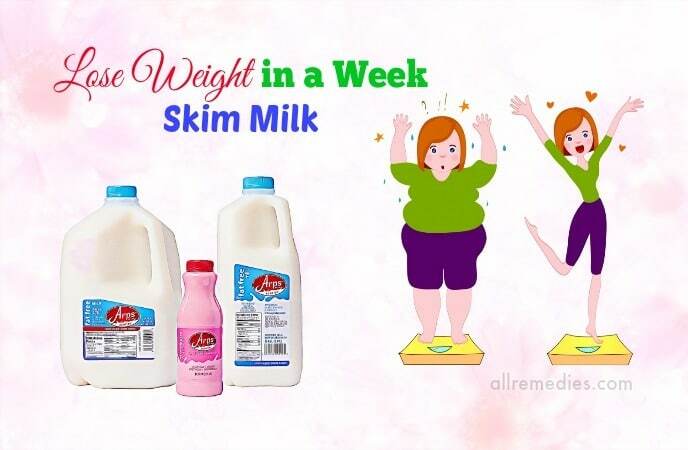 Fat milk can make you gain weight but skim milk is a perfect choice for you to lose weight in a week. Milk has a variety of health benefits; therefore, you should not exclude it from your diet. Drinking a glass of skim milk is also recommended even when you go on a diet. Milk is loaded with calcium, vitamin D, and lean protein that make your bones strong and repair your tissues. After post-workout muscle recovery, you can drink a glass of low-fat chocolate milk. Many people prefer green tea  for a lot of good reasons. Green tea is loaded with powerful nutrients and antioxidants that can not only give you many health benefits but also help you lose weight. Some studies and research have shown the benefits of green tea for weight loss. According to a study, people drinking high-concentration green tea for up to 12 weeks can lose 0.44 to 7.7 pounds, compared with people who do not drink. This is because the catechins present in green tea have the ability to boost your metabolism and fat burning. Want to know how to lose weight in a week with water and drinks? Matcha is a great choice because it is a greater source of catechins than another loose leaf green tea. Not only green tea but also black tea is one of the ideal drinks that help you lose weight in a week . Black tea has a darker color and strong flavor because it has undergone the process of oxidation more than other types of tea. Black tea is rich in polyphenols , powerful antioxidants that help you lose weight effectively and naturally. According to some studies, polyphenols can reduce calorie intake, boost fat breakdown, and increase the friendly gut bacteria. To lose weight with black tea, you should drink 3 cups of black tea for at least three months to see the best result. Apple cider vinegar is a great home remedy for many health and beauty issues. In this article, we would like to introduce it as one of the best natural remedies on how to lose weight in a week. Apple cider vinegar  has acetic acid that is responsible for reducing insulin levels, suppressing appetite, boosting metabolism and helping you burn fat. 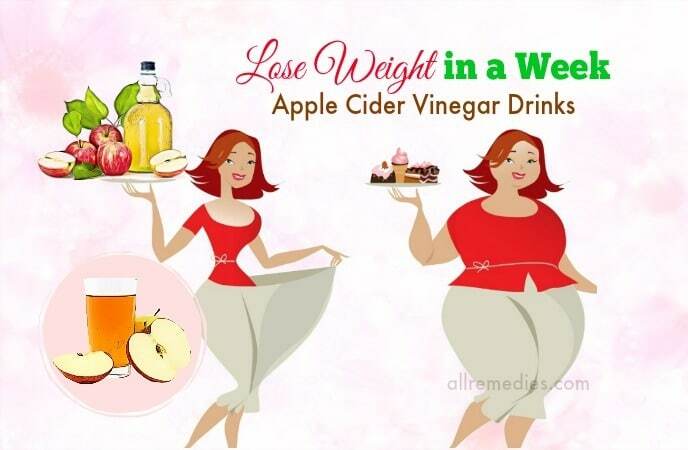 Therefore, consume apple cider vinegar can help you prevent weight gain and reduce fat accumulation in the liver and belly. Furthermore, drinking apple cider vinegar also makes you feel fuller for a long period of time. That helps prevent overeating. Coffee is a beverage that many people around the world love. People often drink coffee in the morning to lift the mood, provide energy and increase the concentration. It is surprising to know that weight loss is one of the benefits of coffee. Caffeine  present in coffee is proven to boost metabolism and increase fat burning, according to several studies. Furthermore, people who often drink coffee can maintain their ideal weight over time. However, do not drink too much coffee because caffeine overconsumption can lead to some health problems and side effects. We have introduced 6 ways on how to lose weight in a week with water and drinks. As long as you have a healthy diet, proper exercise routine, and a balanced lifestyle, you can lose weight easily. Many drinks give you numerous health and beauty benefits, therefore, you should not ignore them. If you have any questions to ask, you can raise your voice by leaving your comment below. We will answer them as soon as we can.